Catherine II, also known as Catherine the Great (Russian: Екатерина II Великая or Yekaterina II Velikaya, born Sophie Augusta Fredericka of Anhalt-Zerbst; May 2, 1729 – November 5, 1796) reigned as Empress of Russia for more than three decades, from June 28, 1762 until her death. She was sometimes referred to as the epitome of an "enlightened despot" and she is rightly remembered as one of the most powerful and successful women rulers, who, like Elizabeth I of England and Isabella of Castile left a permanent mark on her nation, extending territory and patronizing art and learning. Catherine's despotic rule and personal morality suffered from similar moral failures as a great many men in power. On the other hand, she did attempt to democratize governance, suggesting that her instinct was toward egalitarianism. Yet she also reinforced feudalism by tightening the tie between serfs and their overlords. Perhaps Catherine is an example of someone who could not always translate her ideals into practice, either because of the limitations of circumstance or because her motives were also mixed and sometimes contradictory. Russian culture has traditionally honored women, considering that the woman's heart can add nobility to the mind of man. 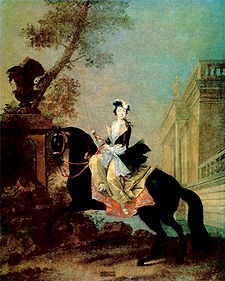 Russia has often been called 'Mother Russia.’ Catherine the Great's successful reign added considerably to the idea of femininity as an essentially Russian quality, understood as a characteristic that men and women can both possess. A German Princess and cousin to Gustav III of Sweden and Charles XIII of Sweden, Sophie (nicknamed Figchen) was born in Stettin to Johanna Elisabeth von Schleswig-Holstein-Gottorp and Christian Augustus of Anhalt-Zerbst, Prince of Anhalt-Zerbst and a Prussian general who governed the city in the name of the king of Prussia. She was educated mainly by French governesses and tutors, in accordance with the prevailing custom in German princely families of the time. Christian Augustus engaged in thorough diplomatic management in order to arrange for his daughter to become wife of the future tsar, Peter III of Russia. Both Count Lestocq and Frederick the Great took an active part as well. The objectives of this match were to strengthen the friendship between Prussia and Russia, weaken the influence of Austria and ruin chancellor Aleksey Petrovich Bestuzhev-Ryumin, on whom Tsarina Elizabeth of Russia relied, and who was also loyal to the Austrian alliance. The diplomatic intrigue failed, largely because of the intervention of Sophie's mother Johanna, said to a be clever but injudicious woman. Tsarina Elizabeth took a strong liking to Sophie anyway and the marriage finally occurred in 1744. The empress knew the family well because Princess Johanna's brother Karl had gone to Russia to marry the future Empress Elizabeth years earlier, but had died before the wedding took place. Once in Russia, Sophie spared no effort to ingratiate herself not only to her husband, but also to the empress and the Russian people. She applied herself to learning the Russian language with such zeal that she rose at night and walked around her cold bedroom barefoot, repeating her lessons. This habit caused a severe attack of lung congestion in March 1744. She explained in her memoirs that when she came to Russia, she was determined to do whatever had to be done and believe whatever she was required to believe in order to be qualified to wear the crown. Her consistency of character throughout her life makes it highly probable that even at the young age of fifteen, she was mature enough to understand how crucial it was to adhere to this commitment and conduct. Her father, a devout Lutheran, was strongly opposed to Sophie's conversion. Despite his instructions, she was received into the Russian Orthodox Church on June 28, 1744, and was renamed Catherine Alexeyevna (Yekaterina or Ekaterina). On the following day Sophie, now Catherine was formally engaged. She was married to the Grand Duke Peter on April 21, 1745, at Saint Petersburg. The young spouses settled in the palace of Oranienbaum, which would remain the residence of the "young court" for 16 years. The marriage was unsuccessful. It may not have been consummated for 12 years due to Peter III's impotence and mental immaturity. Peter took a mistress. Catherine carried on liaisons with Sergei Saltykov and Stanisław August Poniatowski. She became friends with Ekaterina Vorontsova-Dashkova, the sister of her husband's mistress, who introduced Catherine to several powerful political groups that opposed Peter. Well read, Catherine kept up to date on current events in Russia and the rest of Europe. She corresponded with many of the great minds of her era, including Voltaire and Denis Diderot. In 1762, after moving into the new Winter Palace in Saint Petersburg, Peter succeeded to the throne as Peter III of Russia. However, his eccentricities and policies, including an unusual fondness for Frederick the Great, ruler of Prussia, (the capital of which the Russian army occupied as a result of the Seven Years' War), alienated the same groups that Catherine had cultivated. Compounding matters, he insisted upon intervening in a war between Holstein and Denmark over the province of Schleswig. Peter's insistence on supporting his native Holstein in an unpopular war ruined most of the support he had among the nobility. 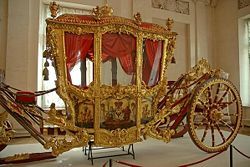 In July 1762, Peter committed the grave error of retiring with his Holstein-born courtiers and relatives to Oranienbaum, leaving his wife in St. Petersburg. On July 13 and 14, the revolt of the Leib Guard removed him from the throne and proclaimed Catherine their empress. The result was a bloodless coup; Ekaterina Dashkova, confidante of Catherine, remarked that Peter seemed rather glad to be rid of the throne, requesting only a quiet estate and a ready supply of tobacco and burgundy in which to rest his sorrows. Six months after her ascension to the throne on July 17, 1762, Peter III was killed by Alexei Orlov (younger brother to Gregory Orlov, then court favorite and a participant in the coup d'êtat). It was supposedly an accidental killing, the result of Alexei's overindulgence in vodka. During the Soviet period it was assumed proven that Catherine ordered the murder. She also disposed of other potential claimants to the throne, Ivan VI and Princess Tarakanova at about the same time. Now, some historians tend to doubt her involvement because of the long-running tensions between Alexei Orlov and Catherine. During her reign, Catherine extended the borders of the Russian Empire southward and westward to absorb New Russia, Crimea, Right-Bank Ukraine, Belarus, Lithuania, and Courland at the expense of two powers; the Ottoman Empire and the Polish-Lithuanian Commonwealth. All told, she added some 200,000 square miles (518,000 square kilometers) to Russian territory. She shaped Russian destiny to a greater extent than almost anyone before or since, with the possible exceptions of Vladimir Lenin, Josef Stalin, and Peter the Great. 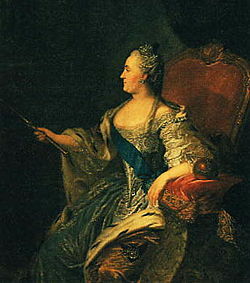 Catherine's foreign minister, Nikita Ivanovich Panin, exercised considerable influence from the beginning of her reign. Though a shrewd statesman, Panin dedicated much effort and millions of Russian rubles to the creation of a "Northern Accord" among Russia, Prussia, Poland, Sweden, and perhaps Great Britain, to counter the power of the House of Bourbon-Habsburg League. When it became apparent that his plan could not succeed, Panin fell out of favor and in 1781 was dismissed. Catherine made Russia the dominant power in the Middle East after her Russo-Turkish War, against the Ottoman Empire (1768-1774), which saw some of the greatest defeats in Turkish history, including the Battle of Chesma and the Battle of Kagul. The victories allowed Russia to obtain access to the Black Sea and to incorporate vast areas of what is now South Ukraine, where the cities of Odessa, Nikolayev, Dnepropetrovsk, and Kherson were founded. 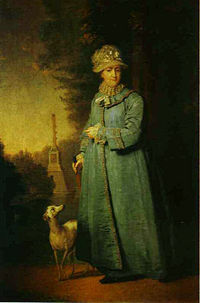 Catherine annexed Crimea in 1783, only nine years after it had gained independence from the Ottoman Empire during her first war against the Ottomans. The Ottomans started a second Russo-Turkish War during Catherine's reign. This war (1787-1792) proved catastrophic for them and ended with the Treaty of Jassy, which legitimized the Russian claim to Crimea. Catherine played an important role in the European political theater, acting as mediator in the War of the Bavarian Succession (1778-1779) between Prussia and Austria. In 1780 she set up a group designed to defend neutral shipping against Great Britain during the American Revolution. She refused to intervene in the revolution on the side of the British when asked. In foreign affairs, she was ever conscious of her legacy, and longed to be perceived as an enlightened sovereign. She pioneered Russia's role of international mediator in disputes that could or did lead to war. England came to play this same role throughout most of the nineteenth and early twentieth century. From 1788 to 1790 Russia was engaged in a war with Sweden, led by Catherine's cousin, the Swedish King Gustav III. Gustav began the war to reclaim the Baltic Sea territories lost to Russia in 1720. Expecting to simply overtake the Russian armies still engaged in war against the Ottoman Turks and hoping to strike Saint Petersburg directly, the Swedes ultimately faced mounting human and territory losses when opposed by Russia's Baltic fleet. After Denmark declared war in 1789, things looked bleak for the Swedes. After the Battle of Svensksund a treaty was signed August 14, 1790, returning all conquered territories to their respective nations, and peace reigned for 20 years. In 1763 Catherine placed former lover, Stanislaus II, on the Polish throne. Although the idea came from the Prussian king, Catherine took a leading role in the partition of Poland in the 1790s. This action was motivated by concern that the May Constitution of Poland might bring a renaissance of the Polish-Lithuanian Commonwealth power and the growing democratic movements inside the Commonwealth might become a threat to the European monarchies. After the French Revolution, Catherine rejected many of the principles of the Enlightenment that she had previously claimed to support. In order to stop reforms of the May Constitution and not allow modernization of the Commonwealth, she provided support to a Polish anti-reform group known as the Targowica Confederation. After defeating Polish loyalist forces in the War in Defense of the Constitution and in Kosciuszko Uprising, Russia divided all of the Commonwealth territory with Prussia and Austria. Catherine generally subscribed to the Enlightenment and considered herself a "philosopher on the throne." She was well aware of her image abroad, and always desired to be perceived by Europe as a civilized and enlightened monarch, despite the fact that in Russia she often behaved like a tyrant. Even as she proclaimed her love for the ideals of liberty and freedom, she did more to tie the Russian Serf to his land and his lord than any sovereign since Boris Godunov (1551-1605). Catherine was known as a patron of the arts, literature and education. The Hermitage Museum, which now occupies the entire old Winter palace, was begun as Catherine's personal collection. Catherine wrote comedies, fiction and memoirs, while cultivating Voltaire, Diderot and D'Alembert, all French encyclopedists who later cemented her reputation in their writings. Subtle as she was forceful, she enlisted one of the great minds of the age, Voltaire, to her cause. She corresponded with him for fifteen years, from her accession to his death. He lauded her with epithets, calling her "The Star of the North" and "Semiramis of Russia," making reference to the legendary Queen of Babylon. Though she never met him face-to-face, she mourned him bitterly when he died. She acquired his collection of books from his heirs and placed it in the Imperial Public Library. Within a few months of her accession, upon hearing that the publication of the famous French Encyclopedie was in danger of being stopped by the French government because of its irreligious spirit, she proposed to Diderot that he complete his great work in Russia under her protection. Four years later, she attempted to embody the principles of Enlightenment learned through her study of the French philosophers, into a legislative form. A Grand Commission, acting as a consultative parliament, composed of 652 members of all classes—officials, nobles, burghers and peasants and of various nationalities—was convened in Moscow to consider the needs of the empire and the means of satisfying them. The Nakaz Instructions for the Guidance of the Assembly were prepared by the empress herself and were, by her own admission, the result of pillaging the philosophers of the West, especially Montesquieu and Beccaria. Many of the democratic principles frightened her more moderate and experienced advisers so she refrained from putting them into practice. After holding more than two hundred sittings, the Commission was dissolved without getting beyond the realm of theory and wishful thinking. At the instigation of her general assistant, Ivan Betskoi, Catherine wrote a manual for the education of young children, drawing from the ideas of John Locke. She also founded the famous Smolny Institute for noble young ladies. This school was to become one of the best of its kind in Europe, and broke ground by admitting young girls born to wealthy merchants alongside the daughters of the nobility. 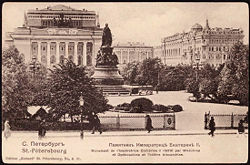 The leading economists of her day, such as Arthur Young and Jacques Necker, were foreign members of the Free Economic Society, established on her suggestion in Saint Petersburg. She was able to lure Leonhard Euler and Peter Simon Pallas from Berlin back to the Russian capital. Her patronage furthered the evolution of the arts in Russia more than any sovereign of that nation before or since. Under her reign, the classical and European influences that inspired the “Age of Imitation” were imported and studied. Gavrila Derzhavin and other writers of her epoch laid the groundwork for the great writers of the nineteenth century, especially the immortal Aleksandr Pushkin. However, her reign was also marked by the omnipresent censorship and state control of publications. When Aleksandr Nikolaevich Radishchev published his Journey from St. Petersburg to Moscow in 1790, warning of uprisings because of the deplorable social conditions of the peasants held as serfs, Catherine had him exiled to Siberia. Throughout her long reign, Catherine took many lovers. Some of these men loved her back, as she was considered quite beautiful by the standards of the day, and was ever generous with her lovers. She often elevated them to high positions for as long as they held her interest, and then pensioned them off with large estates and gifts of serfs. Grigori Alexandrovich Potemkin was believed to be her favorite. After her affair with him, it has been said that he selected a candidate that had both the physical beauty as well as the mental faculties to hold Catherine's interest. The last of her lovers, Prince Zubovwas, was forty years her junior and the most capricious and extravagant of them all. Some argue that the private and sexual morality of leaders is unrelated to their ability to lead, but such views derive from lopsided analyses focusing only on external dynamics of power. She was a harsh mother to her son Paul I of Russia, whom she hinted had been fathered by her first lover, Sergei Saltykov, but who physically resembled her husband, Peter. It seems highly probable that she intended to exclude Paul from the succession, and to leave the crown to her eldest grandson Alexander I of Russia, later the Emperor Alexander I. Her harshness to Paul was probably due to political distrust as a result of observing his character. Whatever else Catherine may have been, she was first and foremost a sovereign and a politician whose main priority was to do what she saw fit in order to protect the interests of the state. She kept Paul in a state of semi-captivity in Gatchina and Pavlovsk. She was determined not to allow her authority to be disputed by her son, or shared by him. Catherine kept Alexis Bobrinski, her illegitimate son by Grigori Orlov, aloof from the court. Although she did acknowledge him as her son. Catherine suffered a stroke while taking a bath on November 5, 1796, and subsequently died at 10:15 P.M. the following evening without regaining consciousness. She was buried at the Peter and Paul Cathedral in Saint Petersburg. Palace intrigue generated several urban myths related about the circumstances of her death that put her in rather unfavorable light. Because of their sexual nature, they survived the test of time and are still widely known even today. 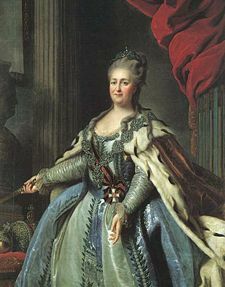 History of "Catherine II of Russia"
This page was last modified on 19 January 2017, at 16:22.